The Quilting Hermit: FNSI and other exciting news! First of all, Friday Night Sew-In is back! You know, Friday Night Sew-In! 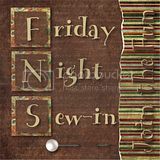 Where we as a quilting community all stay home on Friday night and sew our butts off! Not that it's any different than what I've been doing on my last few Friday nights, but hey - it's a good excuse to use to stay home and sew. It's taking place this Friday, September 17th. As for me, I got my email matching me up with my Brown Bag Quilt partner this morning. The Brown Bag Quilt project is being run by JoyLyn, a poster on Stash Manicure (link goes to the BBQ post), and basically you get matched up with a partner, exchange 2 yards of unwanted fabric, and make a quilt using 90% of the fabric given to you by your partner in it. You are allowed to buy a backing, though, and add as much of your own fabric as you'd like. The best part about it...well...it'll take a mini story to explain. As you know (if you've read this at all), I live in Germany, but I'm not German. I'm just here for a few years. I live in a German town, but I work with other Americans. When I signed up for the BBQ contest, I gave JoyLyn my American address. APO boxes are fantastic for those of us living here, because shipping isn't any more expensive than sending something to New York City would be. So families can send you care packages without having to pay tons of money. I had to explain how that address worked to JoyLyn, but in the end she was happy and everything was finalized about my address. When I got my partner email, imagine my complete shock when I saw that my partner lives less than a mile from me! JoyLyn didn't know what city I lived in here, but she somehow paired me up with someone who lives in my town! I mean, seriously - how cool is that? Karin (my partner) and I are going to meet up in person to exchange our fabric this weekend (hey - we both work full time, so give us a break!). I am going to have another real-life quilting friend! She's interested in maybe hanging out and sewing together sometime too. I'll have to clean my house thoroughly (I think the excuse that I just moved in is starting to wear off a bit) and find homes for some stuff before she does, but I'm so excited! In other news, I finished Pop-Pop's quilt top. I don't have a picture, mostly because it looks exactly like it did in my picture. I have a package that I'll be getting tomorrow - I really hope it's the backing and batting for this quilt! I ordered it about a week ago-ish, so maybe it is. :) While waiting for Pop-Pop's quilt pieces to come in, I've been working on my next quilt - the fall quilt. Surprisingly, I've cut out all the squares except for the tree (I'll post the design hopefully by this weekend...tomorrow and Thursday are busy for me, so I doubt I'll get it done before then) using just my stash. I did get a bit of help, since I had a few leftover squares from a baby quilt I made. I purposely cut out extra squares for that baby quilt since I was doing a scrappy trip around the world design (it was made of blocks of trip around the world, so I didn't need to have a bunch of any one fabric) and wanted to make sure that I'd have enough blocks to complete the design. So some of my sky blocks and some of my grass blocks are leftovers from that, but I've cut almost 600 squares in the last few evenings. I'll have to get a picture of my living room for you - it's a total mess! I have fabrics literally strewn all over the couch and floor! Most of them aren't folded, and the piles of squares on the table are really impressive! Anyways, I hope you guys are having a wonderful day/night/whatever it is for you! It's almost bedtime for me (almost 2030 here!) so I'm off to finish cleaning the kitchen and make my lunch and dinner for tomorrow. Tschüss (that's German for bye, and it's pronounced kind of like tchewsss)! You are so lucky to be paired with someone you can meet in person. I love that! So glad you are sewing with me this Friday too!